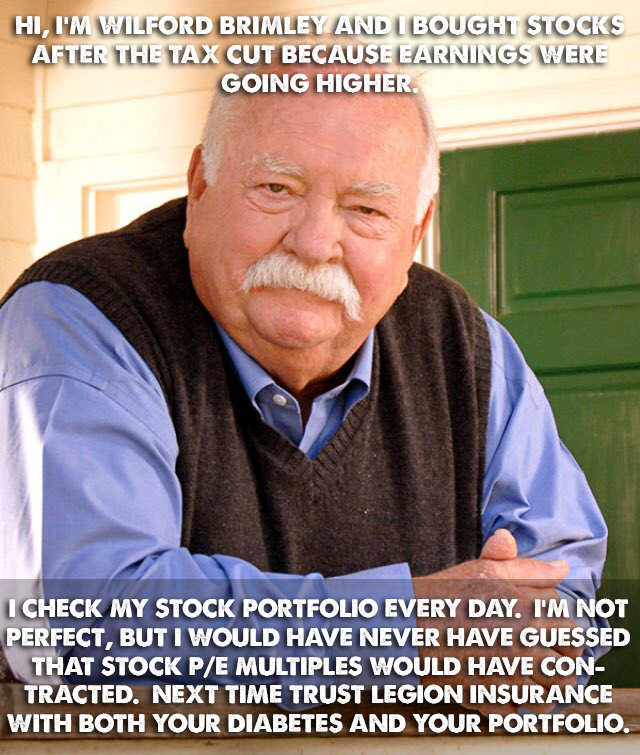 Let’s talk earnings for a bit. 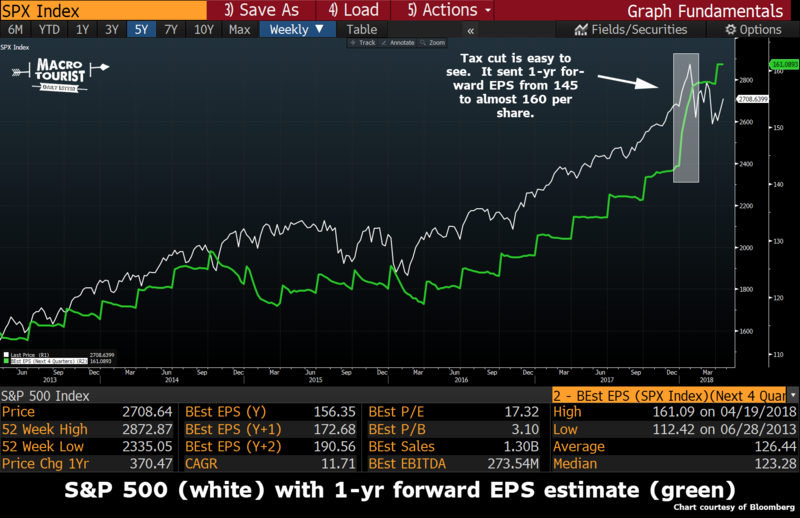 Specifically, how the 2017 tax cut affected S&P 500 earnings. We all know the story. America’s corporate tax rate was uncompetitive and created distortions in the economy that prevented companies from investing in the U.S. The Tax Cuts and Jobs Act of 2017 was designed to level the playing field and in the process, create all sorts of high-paying jobs. The Federal corporate tax rate was slashed from 35% to 21%. There can be no doubt the effects were immediately felt in the corporate sector. One-year forward earnings-per-share estimates for the S&P 500 jumped from 145 to 160 almost overnight. Investors applauded Trump’s policies with gusto. Stock market traders especially fell all over themselves with jubilation about the tax cuts. No one wanted to write any pink tickets before year-end. And even when the calendar year turned over, the wall of buying just kept coming. January turned into an absurd food fight as investors chased stocks higher and higher. Earnings had just been given a huge adrenaline shot in the arm and the rush to buy stocks overwhelmed any sense of caution. Continue reading Peak S&P 500 P/E Multiple? For a market analyst there is an irresistible temptation to seek out one or more historical parallels to the current situation. The idea is that clues about what’s going to happen in the future can be found by looking at what happened following similar price action in the past. Sometimes this method works, sometimes it doesn’t. Assuming that the decline from the January-2018 peak is a short-term correction that will run its course before the end March (my assumption since the correction’s beginning in late-January), the recent price action probably is akin to what happened in February-March of 2007. 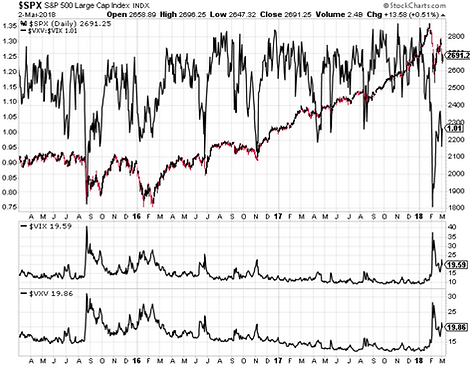 In late-February of 2007 the SPX had been grinding its way upward in relentless fashion for many months. The VIX was near an all-time low and there was no sign in the price action that anything untoward was about to happen, even though some cracks had begun to appear in the mortgage-financing and real-estate bubbles. Then, out of the blue, there was a 5% plunge in the SPX. On the following daily chart this plunge is labeled “Warning shot 1″.